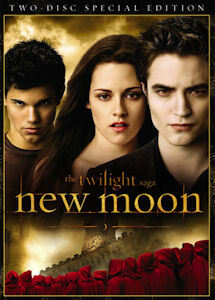 My wait for New Moon only began last March when I first saw Twilight on DVD in the comfort (and quiet) of my own home. Of course, that set off a case of "Twi-Mania" first shared in My "Twilight" Zone. I knew I would allow myself a trip to the theater to see the next installment in The Twilight Saga. As previously mentioned, I really only made a point of seeing the latest Harry Potter movie at the cinema. While in my 20's and 30's I went to the "movies" frequently. For several years I had a theater in the same shopping center where I worked. That made seeing movies there a no-brainer. I just now chuckled over the fact that it was the "Twilight" showing that I attended most Sundays. It was just $2.95 to see any new release. What a bargain! While waiting in line my husband mentioned something about going home and that he could call someone to come pick him up (good, 'cuz I wasn't leaving.) Of course, he ended up staying. Although, I feel that he probably does wish he had avoided the entire "ordeal." General impressions with some possible ***spoilers***. There were only two previews before the gigantic moon showed on the screen. Then slowly n-o-o-M w-e-N is revealed. Ooooh! None of the usual long and drawn out opening credits. Let's get straight to the movie folks. Yes, it is very different from Twilight, but we all knew it would be. The vampires look different. Their eyes (contacts) were the most visible change. Hair and attire were different. I was fine with those changes. Edward. Ah, Edward. I think that he looked more like Rob (doesn't everyone including Rob?) Not so much about the hair in this one. Yay! Now, this is a biggy for me. The script was fleshed out more. Not so much of the incoherent teen mumblings. Jessica can actually speak! The other school buds had only seconds of screen time. "Book Bella" is Stephenie Meyer's storytelling. "Movie Bella" does some narration, but her movie dialog still needs some work. There were some good (and even humorous) lines delivered well. I got the chills when Edward delivered lines from Romeo and Juliet in class. Good job, Rob! There are differences between the movie and book, of course. I thought the October to November to December to January passing during Bella's blackest period transitioned well to screen. It's not like we haven't witnessed similar instances of time passing in other movies (Notting Hill comes to mind), but I thought it was effective in showing her despair. Maybe not as much as Stephenie did in the book, but still...props to Melissa Rosenberg. Considering the advancement in CGI technology I expected a little more smoothness and grace in the wolves, but still an amazing job. The wolf pack is awesome. The boys "did good." Jacob is what Bella needed, but he keeps breaking his promise. Poor kid. Taylor Lautner (Jacob) is a scene stealer. Billy Burke (Charlie Swan) is too. The Carter Burwell score in Twilight was much more of a presence than the score in New Moon. For some reason, I felt the New Moon score by Alexandre Desplat played like muzak. His piece, New Moon (The Meadow), is a particularly lovely piece though. The soundtrack and score is a really important (and lucrative) part of the Twilight Saga. Stephenie is a genius at selecting music that inspires her stories. I still want the New Moon Score. I can't help it! I also felt that New Moon seemed somewhat disjointed. Something about the editing that didn't quite hit the spot. The scenes didn't flow seamlessly like they mostly did in Twilight. Still, the visual aspect of New Moon is stunning! Twi-Hards will love it. Twi-Haters will snub it, and worse. The Twi-Indifferents may wait until it's on television and then wonder, What's the big deal? The ending, well, I thought it was abrupt (several excellent quotes gone...pfffft!) However, if Eclipse truly begins where New Moon ended, I may be able to adjust my thinking on that. I see it for what it is to me - something that I allow myself to be totally immersed in and enjoy. Cool! Five more albums. Quite varied in sound...different genres. I'm especially looking forward to "burning up" Waking Up. I'm quite crazy about OneRepublic's debut album, Dreaming Out Loud! 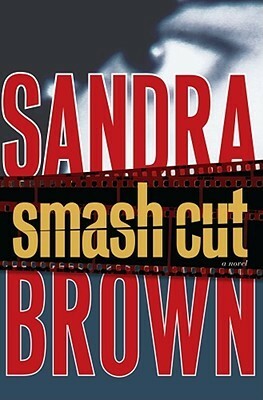 From the queen of romantic suspense and bestselling author of Ricochet comes a thriller full of jarring cinematic twists in which a killer reenacts cinema’s goriest murders. When millionaire Paul Wheeler is murdered, his family retains renowned lawyer Derek Mitchell to defend the victim’s nephew Creighton—although the police have not charged the young man with the crime. Wheeler’s mistress Julie Rutledge, who is also a suspect, believes that Creighton is the killer, despite his rock-solid alibi, and she’ll do almost anything in her quest to prove his guilt—even ruin Derek’s career. But as Derek learns of Creighton’s darker side, especially his bizarre fascination with movie murders, the more he comes to believe Julie is right. The clock ticks down to a shocking ending as Derek and Julie join forces to find the truth. Has Creighton begun re-enacting cinema’s goriest scenes and, if so, who will be his unwilling costars? They won’t know until the final Smash Cut. I had to read quite a few chapters before I started to warm up to any of the characters in this book. Even then I had many reservations about Julie and Derek. Creighton just "creeped" me out. Period. I had my suspicions about Julie and Paul's relationship, but Sandra Brown timed things perfectly (as usual) with the reveal. I thought the ending could not have been better! As always, I'm looking forward to her next novel! There was something very worthy of rolling in on our driveway on this particular day. I have no idea what she found so fascinating, but she returned to it again and again. I was thankful that it didn't stink and didn't stain. Whew! Video taken with my mobile phone on 10/29/2009.